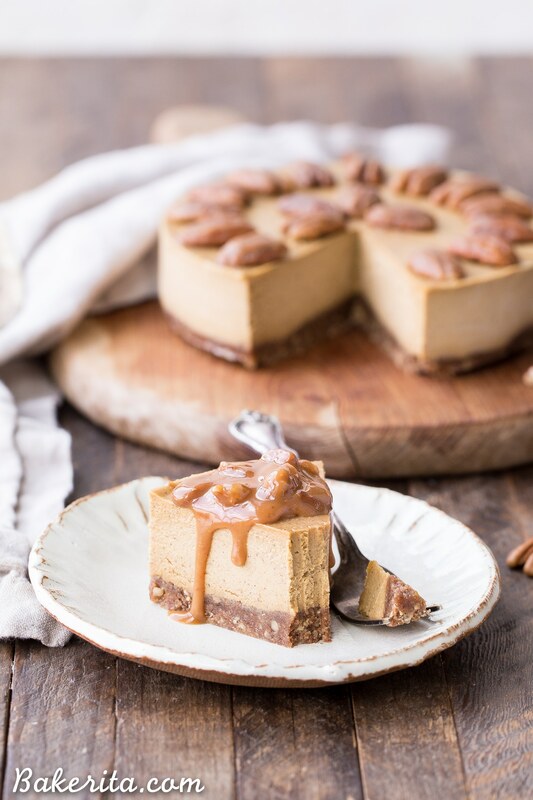 This No Bake Pumpkin Cheesecake is super creamy with a pecan crust and a spiced pumpkin cheesecake filling that’s made with cashews! 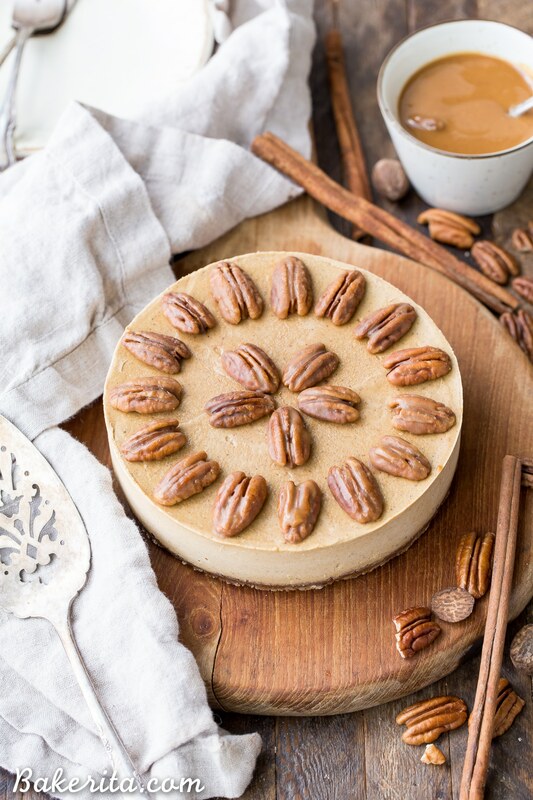 This healthier pumpkin cheesecake is gluten-free, dairy-free, paleo + vegan, and absolutely perfect for the holidays. I’ve started to go pumpkin crazy, spicing everything up with cinnamon and nutmeg, and adding the orange stuff to everything. 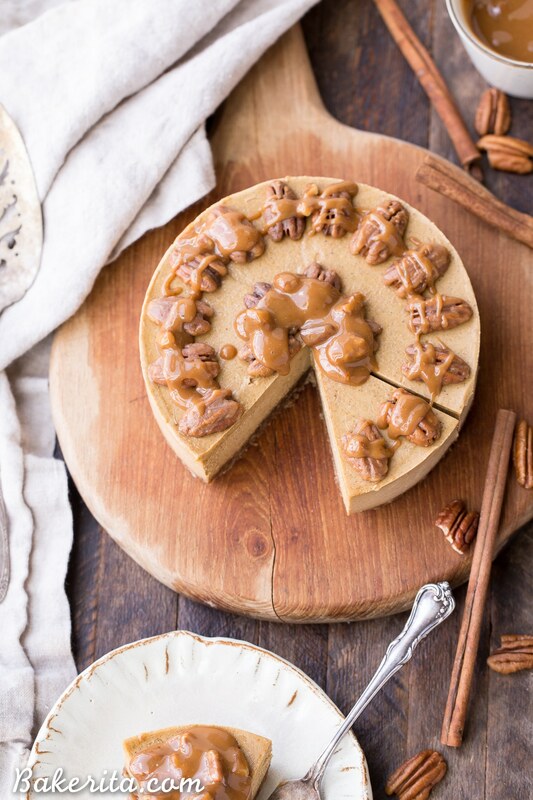 My fall obsession has collided with my other favorite dessert obsession as of late: cashew cheesecakes. The result is this gorgeous, smooth, creamy, super flavorful No Bake Pumpkin Cheesecake. Let’s start at the bottom, with the delectable crust! 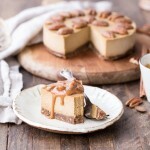 It’s made with a combo of almond flour and pecans – the fatty, sweet flavor of the pecans pairs perfectly with the rest of the cheesecakes flavors, and coordinates with the caramel covered pecans on top of the cheesecake. It’s held together and sweetened with a few dates and spiced with some cinnamon for warmth. The filling is super simple to make, but it does require a bit of forethought since the cashews have got to be soaked for at least 4 hours or so to soften them up. 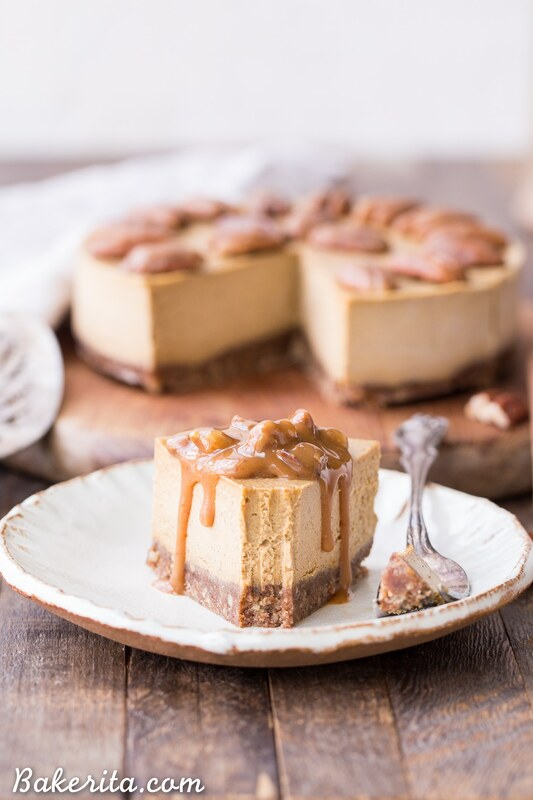 Once the raw cashews are soaked, they transform – you can blend them to be super smooth and creamy, which provides an amazing base for the “cheesecake” filling. You won’t even miss the cream cheese! In addition to the cashews, the filling is made up of an all-star cast of Fall ingredients: pumpkin puree (of course), maple syrup, molasses, vanilla, cinnamon, nutmeg, ginger, allspice, and cloves, along with some coconut oil to help it firm up and coconut milk to help it blend easily. That’s all! And to make it, you just whiz everything in a high-powered blender (I use my Vitamix) or a food processor. A little more patience is required as you wait for the pumpkin cheesecake to set in the freezer, but after a few hours, you’re ready to devour. BUT don’t forget the SUPER simple caramel sauce to go on top  it’s made with cashew butter, coconut oil, and maple syrup, and it’s amazing. I stirred some chopped pecans into mine too, for some extra crunch. 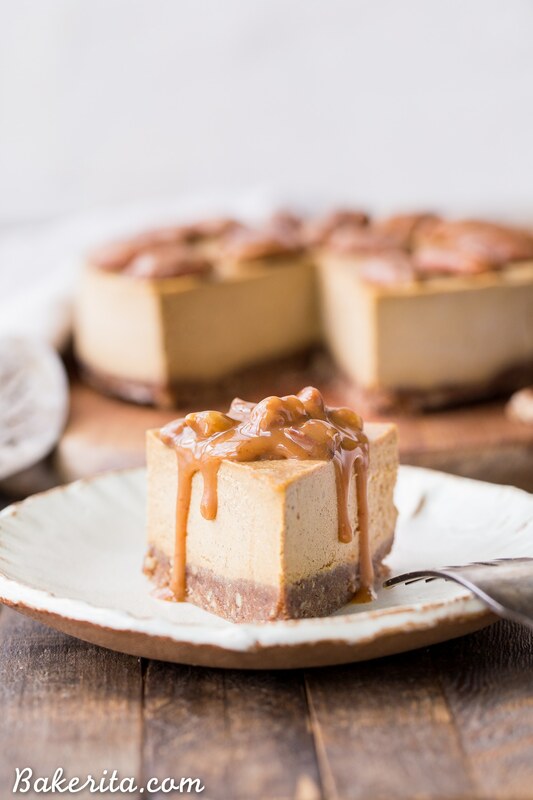 A slice of this no bake pumpkin cheesecake is what Fall dessert dreams are made of – a crunchy, slightly chewy crust topped with a rich, decadent pumpkin spice cheesecake filling and a creamy, sweet caramel sauce drenched on top. When you sink your teeth into this decadence, you’ll be hard-pressed to remember that it’s gluten-free, dairy-free, paleo, and vegan. Whether you make it for a casual weekend or let it have a spot on your holiday dessert table, this no bake pumpkin cheesecake is an intensely satisfying dessert that will steal your PSL-loving heart. Nothing basic about this, though :) enjoy! 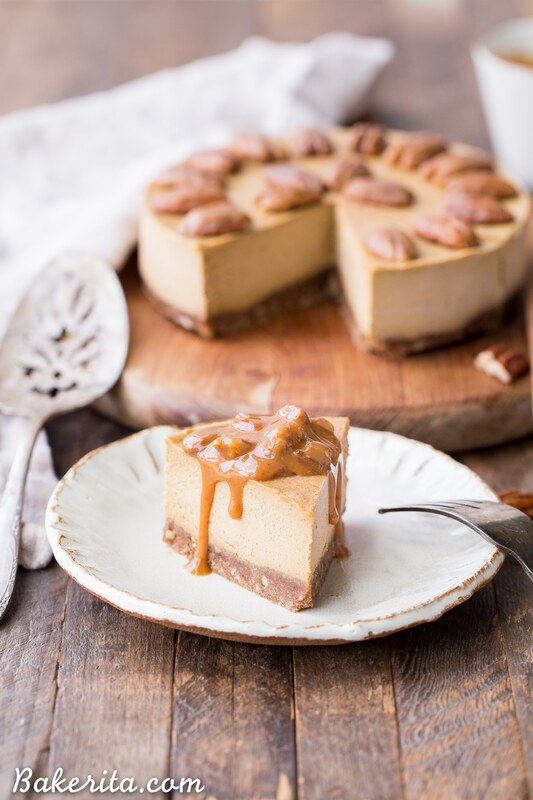 This No-Bake Pumpkin Cheesecake is super creamy with a pecan crust and a spiced pumpkin cheesecake filling that's made with cashews! This healthier pumpkin cheesecake is gluten-free, dairy-free, paleo + vegan, and absolutely perfect for the holidays. In the same food processor or high-powered blender (no need to wash between - I used my Vitamix, but most powerful blenders should do the job), combine all of the filling ingredients and blend for about 2 minutes, or until the mixture is silky smooth and creamy. Scrape down the sides as necessary. You may need to add a bit more coconut milk to get it to blend smoothly if your blender isn’t super high-powered. Pour the filling into the prepared pan over the crust. Smooth out the top and tap the pan hard against the counter a few times to release any air bubbles. Garnish with whole pecans. Place in the freezer to set for at least 3 hours or until completely firm. Serve with the simple cashew caramel sauce. Store leftovers tightly wrapped in the freezer. In a small bowl, whisk together the cashew butter, maple syrup, and coconut oil until smooth and combined. Warm in the microwave for 15 seconds to melt together if any of your ingredients were cool. Stir in the pecans. Please continue to go pumpkin crazy! :) This cheesecake looks so delicious, and I love the caramel topping! Thanks so much for the cheesecake love, Laura! This sounds and looks delicious!! Question though is recipe calls for 2 tablespoons of molasses. What does one do with all the rest of molasses.. I find that recipes call for such small amounts but what do you do with all the leftover ingredients…. Hi Janice, I have a jar of molasses in my cupboard that I’ve used for a year or two. It has a very long shelf life, so it won’t go bad on you if stored in a cool cupboard. If you don’t want to buy the whole jar for one recipe, you can sub more maple syrup for the molasses. Thanks so much for your quick reply. Looking forward to making this!!! Of course, I hope you love it!! So glad you like it, Elizabeth! Thank you so very much. For the crust, could I sub another nut, like actual almonds? Or any other suggestions? I’m allergic to pecans and walnuts… this looks fab! Hi Laken, you could sub any nut you like for the pecans. Enjoy! Hello! Can you explain what to do after soaking the nuts? Do I leave them out to dry on the counter or do I put them in the oven to dry? I’ve read different things online. Thanks so much! Hi Kristen, you don’t dry them at all! The whole point of soaking them is to get them soft enough to blend – you’re probably thinking of sprouting nuts, which is different than soaking them. Once their soaked, just drain, rinse, and move on with the recipe. Thank you so much! I had actually soaked them overnight and then had to get to work this morning before being able to let them dry fully. I didn’t know if I should let them dry entirely before putting them in a sealed container or if it would be okay to leave them out to dry. I ended up leaving them out to dry! Thank you for your response! :) I look forward to finishing it tonight! I made this recipe last weekend for a few guests… it was AMAZING!!! It was very easy to make… definitely will be keeping this one! Thank you for sharing! So glad it was a hit! Thanks Katie. This is the first time I’ve seen/heard of your site. I decided to make this “cheesecake” for my birthday tomorrow and for my family coming for lunch. This is a super big risk for me because I haven’t tried the recipe. I made it tonight and wanted to test the recipe in case I needed to make an emergency cake run. I used Trader Joe’s cashew pieces pieces and soaked them in the fridge for seven hours. The crust is DELICIOUS and has an incredible consistency. It wasn’t difficult to even put at the bottom of my pan. The cheesecake mixture turned out SO creamy and delicious. I just put the cheesecake in the freezer for tomorrow. I will thaw it out an hour before serving because it will have been in the freezer for about 12 hours by that time. I’m super excited to have everyone try it. I’m debating whether or not to tell them that this is a healthy dessert. I’ll post what we all thought when we cut into it tomorrow. I will also make the caramel sauce tomorrow and will post about that too. So far, so good! ☺️ I took some pictures of what mine looks like so far and can post. Hi Adrienne, first of all, happy birthday!!! I hope you love the cheesecake and that it’s a big hit with you and your family. Can’t wait to hear what you think about it! Do you have a recipe for the cashew butter? So looking forward to trying this recipe out. Hi Sara, I use cashew butter from Artisana Organics, but you can just blend raw or toasted cashews in a food processor or high powered blender until it’s smooth and creamy, anywhere from 4-15 minutes. You mention walnuts instead of pecans in the recipe, is that a typo? Also did you add lemon juice to the filling? You mention it in the instructions but not the ingredients. Very excited to try this. I’m planning to bring it to Thanksgiving this year. Hi Erica, thanks for catching that! The recipe is updated now. Hope it’s a hit! With the caramel sauce, do you pour all of it on the cheesecake after it’s done at one time or do you put it in something separate and put it on the cake as you eat it? Got this in the freezer right now and looking forward to eating it! Either way is fine!! I prefer to do it as you eat it because it will harden if you put it in the fridge or freezer already on the cheesecake. Totally personal preference though! Have you tried doubling this recipe? I only have a 12 inch spring pan and really want to make this for the holidays. Looks so delish! Hi Hannah! It should double just fine, but will be much thinner than it looks in the pictures since a 12″ springform pan is more than quadruple the area of the 6″ springform pan (6 inch = 29 square inches, 12 inch = 113 square inches – see more about this here). You may want to make it in a different pan – if you’re okay with them being bars, an 8×8″ pan works great, just make sure to line with parchment paper. Love!! I can not wait to make this. I was wondering if there was a swap I can do for the cashews? I was thinking macadamia nuts? Hello! I cannot find cashew butter, will normal butter work? Also, I’m going to make this a few days before my event. How long will it last in the freezer? Thank you! Cannot wait to make it! !